This Nativity is made of translucent capiz shells placed in brass wire forms. Capiz shells are harvested in the South China and Philippine Seas surrounding the Philippines. The shells are translucent with sun or a candle behind them. The Nativity was made by capiz artisan Juanita Amigo in the Philippines. 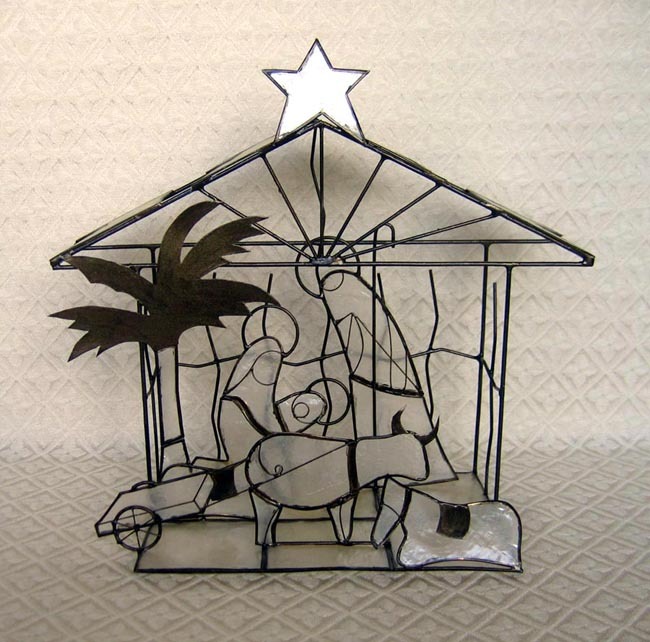 The scene contains the Holy Family in a stable with a star above. Two horses, an ox pulling a cart, and a palm tree complete the scene. The one-piece set measures 10 inches long by 4.5 inches deep by 9.25 inches high. This item is distributed by SAFFY Handicrafts. SAFFY (Social Action for Filipino Youth) Handicrafts handles the marketing and exporting for the Social Action Foundation for Rural and Urban Development (SAFRUDI), a community development organization which was started by an order of Belgian nuns in 1966 to provide employment for women and young people. Besides income generation programs, SAFRUDI has been involved in organizing farmers and fishermen, nutrition education, and emergency medical care. About 20 groups on the Visaya Islands and on Luzon are producing stuffed toys, capiz items, and jewelry for SAFFY.